Mary is from Chicago and will be a junior at Northside College Preparatory High School this fall. Aside from math and technology, Mary likes physics, playing the clarinet, swimming, and reading her favorite author, Tolkien. She is interested in computer programming and hopes to have a career in this field. This Demonstration takes two images of a letter in two different fonts and blends them. 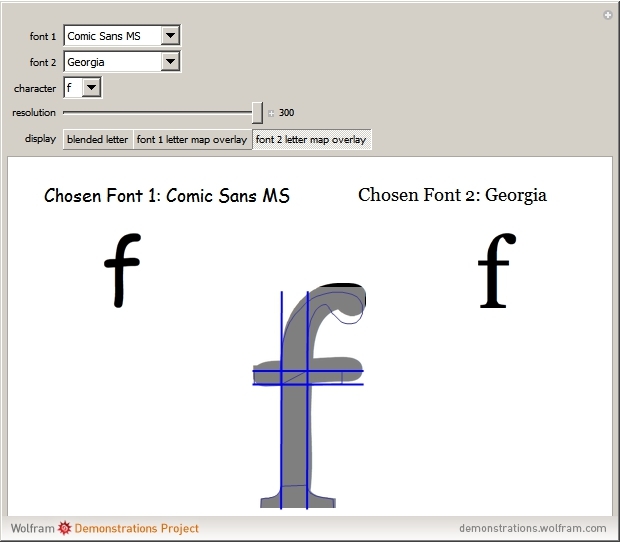 The user can choose both unique fonts from a predefined list as well as any letter in the English alphabet to blend. In addition, the user can choose to view the blended font with an overlay that shows the outline of the original letter (there is one overlay for the first font and one overlay for the second font). The overlays are generated from the corners of the letters and their purpose is to illustrate how the two letters blended. The user can also adjust the resolution of the final blended image to increase blending speed.